Trusting the maintenance and repair of your vehicle to the right company is imperative. 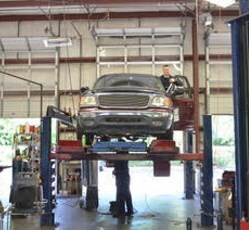 At Dual Automotive, we offer superior auto repair in McDonough, GA, standing behind everything that we do. We understand the importance of great service. For that reason, our team of experts strives to meet, if not surpass, every customer’s expectations. For the past six years, customers in and around the McDonough area have relied on our experience and expertise to keep them safe on the road. With ASE-certified mechanics, you have the assurance you need that a qualified and dedicated professional will work on your vehicle. Unlike other businesses that are often in too much of a rush to properly greet customers or are more interested in taking shortcuts than providing excellent service, everyone at Dual Automotive goes out of the way to be different. From the minute that you walk through the front door, our friendly staff will acknowledge your presence, and instead of skimping to save a few dollars, we use only the highest-quality parts available. When you drop your automobile off for service or repair, we will contact you immediately after finishing so that you can get back to your daily responsibilities. If you prefer to wait, we offer a clean and comfortable customer waiting area, complete with hot coffee, fresh fruits, various snacks, and free Wi-Fi. Our goal is to show every customer the respect that he or she deserves. Being a part of the same community where our customers live and work, we take immense pride in letting them know that we value their loyalty. 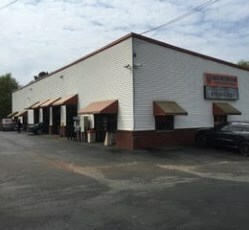 For the best auto repair in McDonough, GA, and the surrounding area, you can always count on us at Dual Automotive. Being safe on the road is a big deal, which is why we take our work seriously, striving to provide outstanding service every time and to every customer. Trusting the maintenance and repair of your vehicle to the right company is imperative. 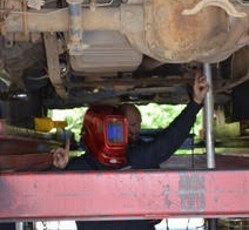 At Dual Automotive, we offer superior auto repair in McDonough, GA, standing behind everything that we do. We understand the importance of great service. For that reason, our team of experts strives to meet, if not surpass, every customer’s expectations. For the past six years, customers in and around the McDonough area have relied on our experience and expertise to keep them safe on the road. With ASE-certified mechanics, you have the assurance you need that a qualified and dedicated professional will work on your vehicle. Unlike other businesses that are often in too much of a rush to properly greet customers or are more interested in taking shortcuts than providing excellent service, everyone at Dual Automotive goes out of the way to be different. From the minute that you walk through the front door, our friendly staff will acknowledge your presence, and instead of skimping to save a few dollars, we use only the highest-quality parts available. When you drop your automobile off for service or repair, we will contact you immediately after finishing so that you can get back to your daily responsibilities. If you prefer to wait, we offer a clean and comfortable customer waiting area, complete with hot coffee, fresh fruits, various snacks, and free Wi-Fi. Our goal is to show every customer the respect that he or she deserves. Being a part of the same community where our customers live and work, we take immense pride in letting them know that we value their loyalty. 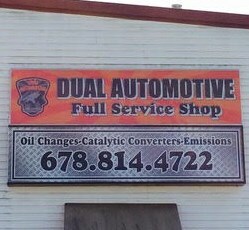 For the best auto repair in McDonough, GA, and the surrounding area, you can always count on us at Dual Automotive. Being safe on the road is a big deal, which is why we take our work seriously, striving to provide outstanding service every time and to every customer.